Hi Friends: Here's my last project for the pre-release of this really cute AKC set Corgi 2017 With Pug Friend from JessicaLynnOriginal stamps. Remember, this set is available for pre-order with free shipping until the release date on 2/25/17. 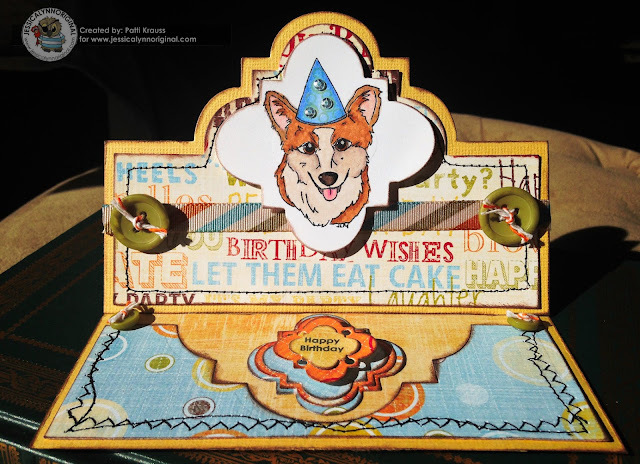 Today's card uses an easel die set that I really love! I think this is my favorite card of the 3 that I worked on! Visit all of my design teammates and see what else they've done with this cute stamp set. Don't forget, if you decide to purchase any stamps or digis from the store, please remember to put my name in the instructions/comments section during checkout. Thanks for joining us for the launch of this stamp set! Happy Stamping! Stamp the Corgi party hat image onto Ultra Smooth Cardstock with Memento Tuxedo Black ink and color with Spectrum Noir markers. 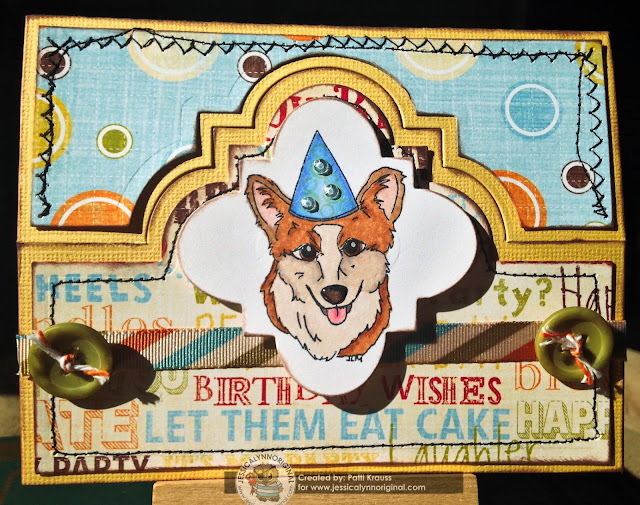 Stamp the small circles onto the party hat with Distress Shabby Shutters ink. Add Glossy Accents for some shine and dimension on the Corgi's eyes and nose. Die cut the Corgi image with the Playful Framelits die. Stamp the Happy Birthday sentiment onto the patterned paper and cut with dies - cut several of the nesting sizes from different colors of the paper pack, ink all edges, then layer them together and put the sentiment on top using foam dots. Die cut the yellow cardstock with the Playful Stand-ups Card die, and cut coordinating sections from the patterned paper pack. Sew the coordinating panels with sewing machine, ink all edges, and add them to the card base. Add the Corgi image to the front of the card using foam dots, then add a few sequins to the hat. Add ribbon and buttons threaded with baker's twine to the card front, and some smaller buttons to act as the stop for the easel stand-up. Send to someone who will enjoy it! Fabulous card Patti! The design is wonderful and the corgi is so cute.